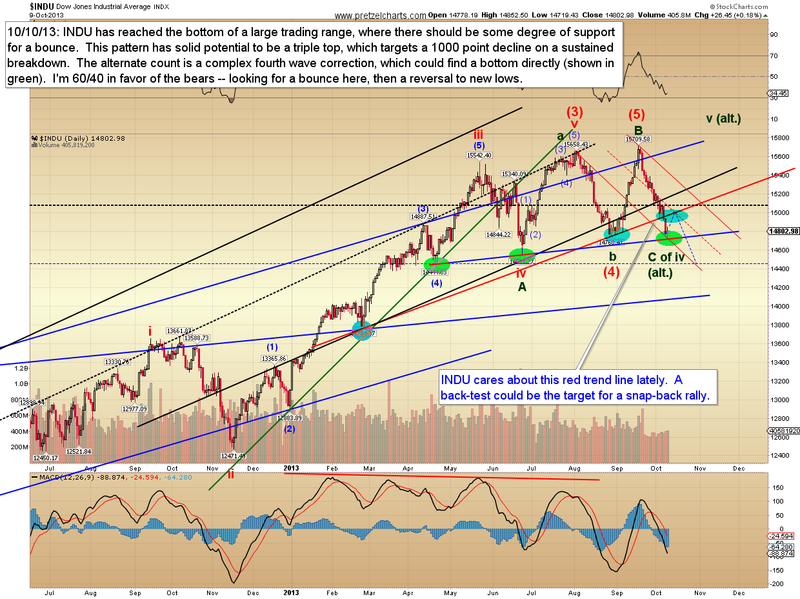 Pretzel Logic's Market Charts and Analysis: Bad Moon Rising? Or Let the Good Times Roll? Bad Moon Rising? Or Let the Good Times Roll? Or that's what it always sounds like to me, anyway. I assume he's singing about one of those highway rest-stop bathrooms, in which case this chorus is very sound advice. On a more serious note, this is the toughest type of inflection point in Elliott Wave. Strangely, the part of this move that had lots of folks confused (last week) felt pretty straightforward to me, and I couldn't find any high probability outcomes that didn't require a continuation of the decline. That has now changed, and we can see on the chart above that the market currently has potential for a fairly clean, and possibly complete, ABC decline. 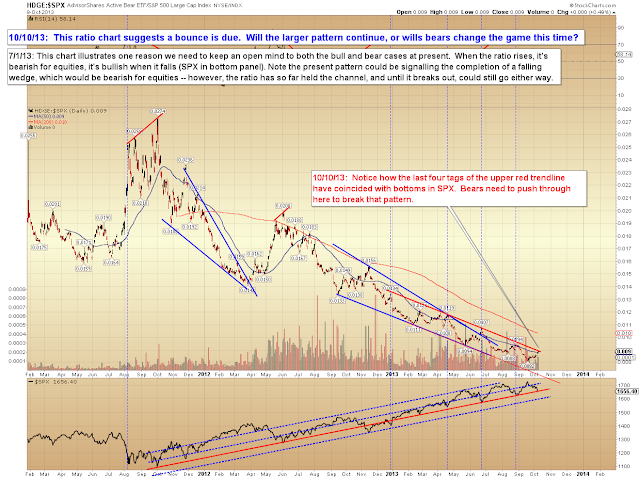 We also see that it has so far found support where it "should." 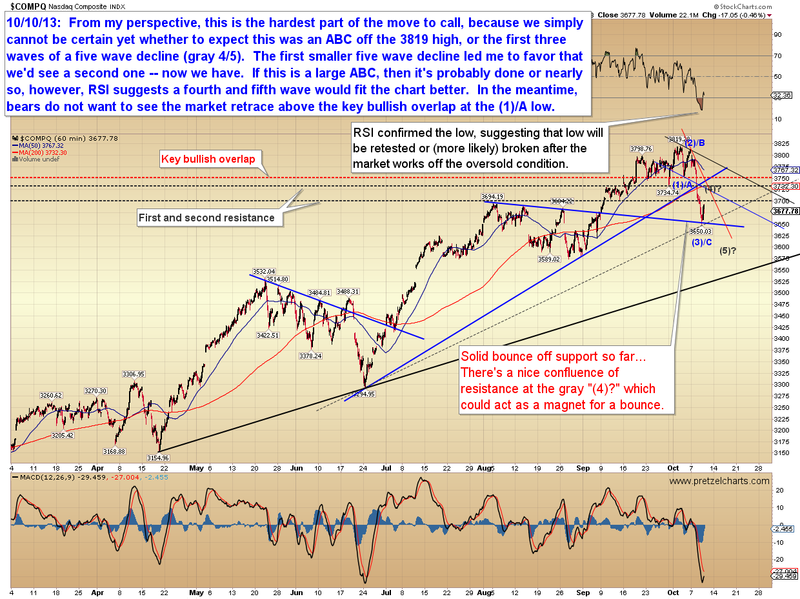 Most of the markets I look at have reached similar support zones, with NYA, INDU, and SPX among them. But not so fast -- when we look at RSI on the above chart, it suggests the market will want to retest or break yesterday's low. And that fact is one of several that leads me to give the edge to the bears and assume we're dealing with a reaction rally until proven otherwise. 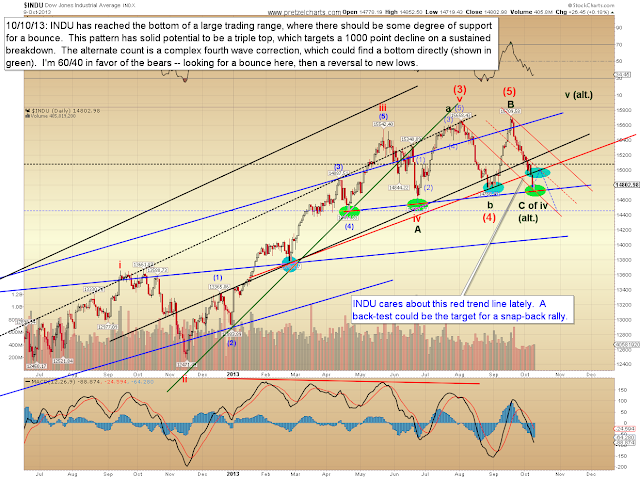 Additionally -- not to get too far ahead of the market -- but some of the charts I've studied suggest the possibility that this is yet another second wave bounce. If that's the case, the market is actually gearing up for a mini-crash. This is dangerous territory for bears here, though, because this is an inflection point where bulls genuinely have a chance to grab the ball at intermediate degree. Thus my confidence in what's coming next is lower than it has been to this point. If I had to pick a side, I'd say the bounce is going to be short-lived, and bears are going to reclaim the market in fairly short order. That logically leads me to consider the two big news events: the ongoing government shutdown, and the debt ceiling deadline on Friday. Futures are up big right now on the news that the President and the GOP are going to meet and talk -- if my bear thesis is correct, then I suspect those talks will end in failure. It's always easy to talk theory, but as traders, how do we approach the market when the charts are ambiguous? 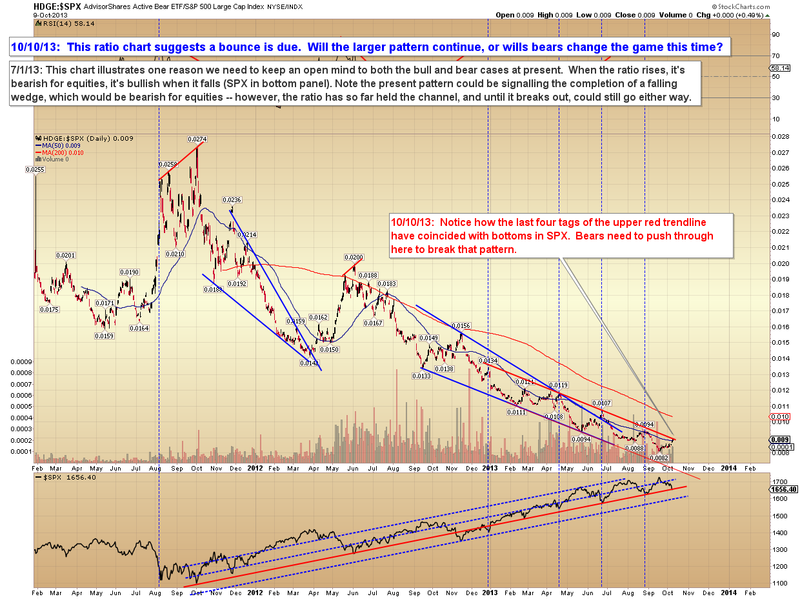 With the charts at larger inflection points and major "blow up the tape one way or the other" news announcements coming, I generally do one of two things: I either avoid the market entirely, or I look for areas that I'd consider as lower-risk near-term inflection points which could reverse a move. 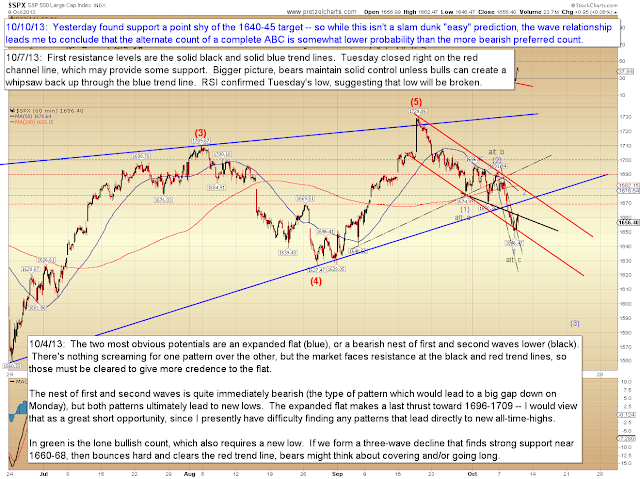 The two zones that jump out at me on the S&P 500 (SPX) are 1670-74 and 1680-85. Both of those zones have the potential to offer resistance and reverse a rally. And as I'm writing this, I can't seem to get 2008 out of my head, and I'm reminded of the monster rally we had just before the crash started. That rally was a Gift from Above for me, and I shorted into it with every dime I had. In 2008, though, I felt almost 100% certain we were about to crash -- so certain, in fact, that I literally couldn't even comprehend who on earth was buying the market there, or why. I don't feel anywhere near that level of confidence here at the present inflection point, but I do think there's potential for a solid risk/reward play to catch either a fifth wave down to new lows, or a much more serious decline. In other words: this is not the type of place where I'd bet the farm with no stops, but certainly the type of place where I'll take a crack at things if I can find ways to limit my potential losses. The Dow Jones Industrial Average (INDU) has reached the bottom of a large trading range -- this is one of the charts I referenced earlier regarding markets that reached support zones yesterday. Finally, the SPX chart. As noted, I'm inclined to favor the bears -- but this isn't a clear-cut slam dunk to me the way last week's charts were. 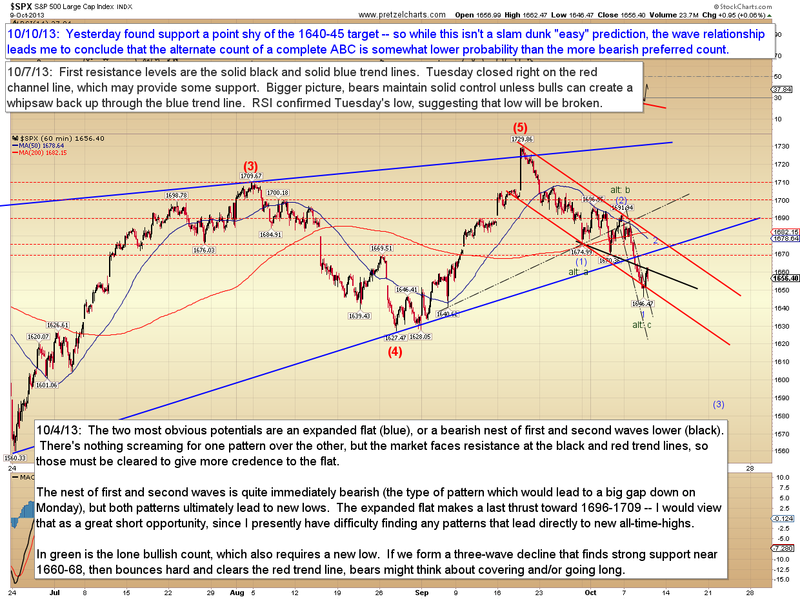 Yesterday's market found support about a point shy of where it "should have" for the bullish alternate ABC decline. In conclusion, the charts are clearly lining up for "an event," and we have two big news items on the horizon. The bulls have potential here, and I'm not closed to that; so if the present rally forms itself into five larger waves, then we'll have to start thinking bigger rally and start looking at new upside targets beyond the two noted zones. That bull potential makes me a cautious bear, but we're still just dealing with a potential and we aren't actually to the point where it's become high probability. On balance I presently think the odds still favor the bears; and that means we have to take that thesis to its logical conclusion: if the bearish wave counts are correct, then bears are getting ready to hit the market hard. So to close out the question posed in the title of today's article: There may indeed be "a bathroom on the right" in the market's not-too-distant future. Trade safe. dear PL, looks like the price action has tracked your levels very closely. We are really at the cusp of a turning point. Will you use the daily close prices to determine your position? 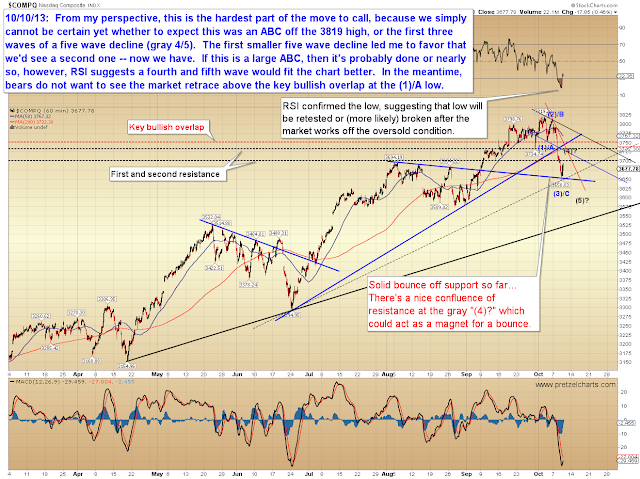 prices are sitting at levels that could negate the bearish count, yet not above. Do you feel odds have decreased significantly with the rip higher?